We’d love your help. Let us know what’s wrong with this preview of A Texas Christmas Reunion by Eve Gaddy. Years ago, Harlan Sullivan broke Savannah Taylor's heart. Now, he's back in Whiskey River as the new owner of the local construction company–and Savannah's new boss. Giving up Savannah was the hardest thing Harlan ever had to do, but it’s way past time to explain why he did. Besides, after fourteen years, they have both moved on. Or so he thinks—until their unexpected meet Years ago, Harlan Sullivan broke Savannah Taylor's heart. Now, he's back in Whiskey River as the new owner of the local construction company–and Savannah's new boss. Giving up Savannah was the hardest thing Harlan ever had to do, but it’s way past time to explain why he did. Besides, after fourteen years, they have both moved on. Or so he thinks—until their unexpected meeting at Felicity’s Christmas Ball shocks him into realizing his buried feelings—and secret passion—are very much alive. To ask other readers questions about A Texas Christmas Reunion, please sign up. The series moves from 1918 to the present day and features thr There are four books in the series, each written by a different author but all featuring Felicity - the matchmaking ghost! She was looking forward to marrying the love of her life, Drew Harwood, after he returned from fighting in the first world war. However, fate intervened and she died of Spanish Flu shortly after his return. Felicity didn’t want him to stay alone and took steps to help him and others to find their HEA at Christmas. The series moves from 1918 to the present day and features three friends who live in Whiskey River - Savannah Taylor, Rachel Wilson and Avery Burton. Now the notorious three bad boys from the Barrel area of town, Harlan Sullivan, Elijah Lane and Logan Calloway have returned to town having, against the odds, made a success of their lives. In each of the next three stories in this series the focus is on one of these couples and the first couple are Savannah and Harlan who were secret lovers as teenagers until Harlan unexpectedly broke their relationship off just days after they first made love. She was understandably devastated and has been reluctant to trust anyone with her heart ever since. Now he's bought the construction company where Savannah works. How will she cope with her first love's return? Will the chemistry between them still be as volatile? Why did he leave? Can Felicity work her lavender scented ghostly influence on these two to give their love a chance? As soon as I saw the author, I knew I'd love this story! She has a great way of bringing characters to life within the pages of her story and she did just that in this sweet second chance romance, too. The drama of secrets from the past being revealed, how Harlan is prepared to help save someone who was instrumental in breaking up their teen romance to ensure Savannah's happiness is so sweet! I loved this story and look forward to reading the next two! Savannah is ready to move on from the last relationship she just needs to get through the Ball and what better way but with her friends. She can't believe her eyes when she sees Harlan the last person she wants to see but she can do this right. Harlan is home and is ready to be there for his family and enjoy his new business venture, but he has a secret and only wants to protect the person it will affect the greatest. Can he protect the only women he has ever loved or will it be over for good? I Savannah is ready to move on from the last relationship she just needs to get through the Ball and what better way but with her friends. She can't believe her eyes when she sees Harlan the last person she wants to see but she can do this right. Harlan is home and is ready to be there for his family and enjoy his new business venture, but he has a secret and only wants to protect the person it will affect the greatest. Can he protect the only women he has ever loved or will it be over for good? I really love this small Texas town of Whiskey River. This book was fun and really gets you into the spirit of Christmas. This book has adult language and scenes and will not be suitable for all ages. I did enjoy how the author did not make Savannah this "weak" women but someone who took what was given and did amazing things. I really loved how to me there was no "hero" in the story but there was two amazing main characters who were super fun to read. A Texas Christmas Reunion by Eve Gaddy, book two in the Whiskey River Christmas series. A few addition to the series. I really enjoyed the sweet story and the likable characters. Looking forward to reading more in this series and more books by Eve Gaddy. A Texas Christmas Reunion was such a fun story for the Christmas season. Full of the magic of a small town celebration, traditions and close knit community Once again Felicity has the chance to help another couple find their way back to each other. I do believe Felicity is my favorite matchmaking ghost..
Harlan is back in town, and he’s not back as the poor boy from the Barrels this time. He’s bought the construction company that Savannah works at, and if the Ferrari he now drives is any indication – Harlan is doing quite well in the world these days. A successful businessman, Harlan is back in Whiskey River to work with his friends on a variety of projects. Discovering Savannah is still here and very much an important part of the business he just purchased is perhaps a plus, or perhaps a mistake, only time and Savannah’s reactions will tell. Oh, Harlan and Savannah have a history… unfortunately, a history that left them both brokenhearted for different reasons. Now Harlan’s grown up with his own power to wield, and he’s not backing down from her pompous father ever again. He broke her heart once, now can he win it back again when she finally knows why he left her in the first place. It’s not going to be easy, but Savannah is worth the fight, he doesn’t want to fight dirty but he will if pushed. Can one matchmaking Christmas ghost help these two see the truth about their love? It’s such fun to be back in Whiskey River again. If you followed the original Whiskey River series then you’ll be glad to know that the familiar faces and places are still here, even though the town is growing like a wild weed. Harlan and the other men in the modern day portion of the Whiskey River Christmas series will have something to do about the town’s growth. Harlan and Savannah make a compelling couple. They had a true love that was torn from them to now have a second chance at the happiness of a lifetime that they were denied. Would they be the people they are today without those events, hard to know. But they fit so well together that it is no hardship to cheer them on to their happy ending especially when things look bleak. I enjoyed this story so much and I’d highly recommend it for any Romance reader who enjoys a solid story, a loathsome villain even if he is family, a couple who make magic happen and secondary characters that bring this story, and soon their own, alive. this is Savannah Taylor and Harlan Sullivan's story. the former high school sweethearts, Savannah Taylor and Harlan Sullivan, really needed a bit of encouragement. About an hour into the ball, Savannah was able to catch her breath. Everything was organized as well as she could make it and the people she’d delegated to do various jobs were doing them. Introductions were out of the way, the first dance had taken place, and so far everything was even running on time. A Texas Christmas Reunion by Eve Gaddy is a wonderful well written 4 star book. Who can forget the wonderful Whiskey River Series by Eve Gaddy? And any continuation of the series is an added bonus, and a perfect read of another love story in the romantic town of Whiskey River. Fourteen years is a long time for two lovers to be apart, tread through different paths of life and come back full circle to where it had all began. Circumstances, blackmail and social boundaries separate teenage lovers Harlan Sullivan and Savannah Taylor. And now destiny brings them back to their home Who can forget the wonderful Whiskey River Series by Eve Gaddy? And any continuation of the series is an added bonus, and a perfect read of another love story in the romantic town of Whiskey River. Fourteen years is a long time for two lovers to be apart, tread through different paths of life and come back full circle to where it had all began. Circumstances, blackmail and social boundaries separate teenage lovers Harlan Sullivan and Savannah Taylor. And now destiny brings them back to their hometown of Whiskey River, with Harlan buying out the construction company that Savannah happens to be the office manager. Old feelings haven’t died, the spark of lust and attraction is very much present, and with the feeling of belonging with each other even stronger than before, and add in the magical season of Christmas, and “A Texas Christmas Reunion” is a warm and emotional read. Eve Gaddy did a wonderful job penning a beautiful story of love and support, relationships and friendships, the good and the bad of life, and add in a dash of the previous couples in attendance, and we have a story to read by the fireplace. I enjoyed ready this amazing second chance story at love, A Texas Reunion by Eve Gaddy, book two in the Whisky River Christmas series. Harlan Sullivan broke Savannah Taylor's heart, which was the hardest thing he had ever done. Now he’s back in Whiskey River as not only the new owner of the local construction company but also as Savannah's new boss. When these unexpectedly meet at Felicity’s Christmas Ball they both realize that those long buried feelings are still very alive. Maybe it’s finally I enjoyed ready this amazing second chance story at love, A Texas Reunion by Eve Gaddy, book two in the Whisky River Christmas series. Harlan Sullivan broke Savannah Taylor's heart, which was the hardest thing he had ever done. Now he’s back in Whiskey River as not only the new owner of the local construction company but also as Savannah's new boss. When these unexpectedly meet at Felicity’s Christmas Ball they both realize that those long buried feelings are still very alive. Maybe it’s finally time for him to share the reason he left fourteen years ago before these two can move forward. It still takes a bit of Christmas magic from the Harwood Inn ghost to bring this reluctant banker’s daughter and determined Barrels Bad Boy to their happily-ever-after. I really enjoyed this sweet love story and had trouble putting this book down, reading this book in one day. Ms. Gaddy is a wonderful story teller, drawing me into her books, making me forget the world around me as she drew me in and not let me go until I turned the last page. I highly recommend this book to other readers. Whiskey River, Texas is becoming as real to me as Marietta, Montana with more books being added to this series. In A Texas Christmas Reunion by Eve Gaddy, Harlan Sullivan has come home, now wanting a second chance at love lost years ago. Felicity’s Christmas Ball has Harlan digging up feelings that were supposed to be long dead. However, at the Harwood House B&B, Felicity is still at work brining couples together. Never mind that this is many, many years after her demise. Just some mystical Whiskey River, Texas is becoming as real to me as Marietta, Montana with more books being added to this series. In A Texas Christmas Reunion by Eve Gaddy, Harlan Sullivan has come home, now wanting a second chance at love lost years ago. Felicity’s Christmas Ball has Harlan digging up feelings that were supposed to be long dead. However, at the Harwood House B&B, Felicity is still at work brining couples together. Never mind that this is many, many years after her demise. Just some mystical to add to this Texas story. It is quite the read seeing Harlan and Savannah dance around each other and their feelings while trying to have a non-complicated relationship. Really no one in life is sophisticated enough to do that which means neither is Harlan or Savannah. I liked these genuine, strong, overcomers. I agree with Felicity, that they are not perfect but perfect for each other after all. This is an awesome love again second chance love story. I love how the story was written. The first book was written about 1918 and this book is present day. I would recommend reading the first book first. Felicity is here trying to make sure there is love in everyone’s life. This story is about Savannah Taylor and Harlan Sullivan. Savannah was in love in high school with Harlan, but after she sleeps with him he leaves town without a word. She is crushed but does move on with her life. Now she is This is an awesome love again second chance love story. I love how the story was written. The first book was written about 1918 and this book is present day. I would recommend reading the first book first. Felicity is here trying to make sure there is love in everyone’s life. This story is about Savannah Taylor and Harlan Sullivan. Savannah was in love in high school with Harlan, but after she sleeps with him he leaves town without a word. She is crushed but does move on with her life. Now she is co-chairing the Felicity Annual Christmas Ball and Harlan shows up. He is back in town and now her boss. Why did he leave her? She has so many questions for Harlan. Felicity and the lavender smell is there to help get them back together and questions answered. This book was a fun story to read. I really enjoyed it and can’t wait to read more. I did receive this book from Netgalley and from Tule Publishing. What a wonderful story. I couldn't put it down. I felt so bad for Harlan and Savannah. This is their second chance romance fourteen years later after her father broke them up. This story takes place over the Christmas season and just goes to show that yes love does triumphs over all. I just adored Harlan and his spirit, compassion and ultimate forgiveness. Savannah didn't know that her father caused the break up and she was to be admired for her warmth, understanding and love. I highly recommend What a wonderful story. I couldn't put it down. I felt so bad for Harlan and Savannah. This is their second chance romance fourteen years later after her father broke them up. This story takes place over the Christmas season and just goes to show that yes love does triumphs over all. I just adored Harlan and his spirit, compassion and ultimate forgiveness. Savannah didn't know that her father caused the break up and she was to be admired for her warmth, understanding and love. Another wonderful story from Whiskey River. Savannah and Harlan had secretly dated several years ago when they were in high school. Then Harlan suddenly broke it off with no explaination and vanished from Savannah's life. Now he is back in Whiskey River...and he's her new boss. I loved all of the characters in this story. Well, except for Savannah's dad, but considering how much he did to keep Savannah and Harlan apart, it would be hard for anyone to like him. Felicity (the ghost) certainly had he Another wonderful story from Whiskey River. Love and magic are in the air in Whiskey River when Savannah Taylor and Harlan Sullivan reunite at the annual Christmas ball. There is a ton of chemistry still present and sparking between them. A long ago break up with lingering anger for her and hurt for him lays the unsteady path to a true reunion. The source of their heartache is still trying to tear them apart. They are older and wiser and not the resource empty teens they were and finally get to take control over the situations that arise. Love and second chances along with the scent of lavender are in the air this holiday season for the folks of Whiskey River. Savannah Taylor can't believe Harlan Sullivan is back in town. Not only that he's bought the company that she works for. Doesn't matter. He may have broken her heart once years ago. No way she'll let him near it again. Harlan may have been a scared kid years ago when he was run out of town. Now he can hold his own and he won't rest until Savannah is his again! Nice read and Love and second chances along with the scent of lavender are in the air this holiday season for the folks of Whiskey River. Savannah Taylor can't believe Harlan Sullivan is back in town. Not only that he's bought the company that she works for. Doesn't matter. He may have broken her heart once years ago. No way she'll let him near it again. Harlan may have been a scared kid years ago when he was run out of town. Now he can hold his own and he won't rest until Savannah is his again! I was thrilled to visit whiskey River for A Texas Christmas Reunion. Harlan and Savannah's story was awesome. When Harlan came back home to whiskey River, he had made something of himself and the love and attraction between he and Savannah was still there. I loved the spirit who was very apparent in this story bringing the lovers back together. I enjoyed this story so much I had to re read A Texas Christmas Homecoming by Nancy Robards Thompson. Book 3 in this series. Love second chance romances, and with the help of Felicity's scent of lavender, the matchmaking ghost. Harlan, has returned to Whiskey River as the new owner of the construction company and will be Savannah's new boss. He broke her heart years ago and now has to win it back. He has his job made out, Savannah will not open her heart up again easily. Love returning to Whiskey Creek, great small town romance. Full of emotions, romance and the season of Christmas. I highly recommend this along with Love second chance romances, and with the help of Felicity's scent of lavender, the matchmaking ghost. Harlan, has returned to Whiskey River as the new owner of the construction company and will be Savannah's new boss. He broke her heart years ago and now has to win it back. He has his job made out, Savannah will not open her heart up again easily. This is Harlan Sullivan and Savannah Taylor’s story. This is a great addition to the Whiskey River Christmas series. Harlan and Savannah were an item years ago but circumstances, secrets, and lies tore them apart. After all these years they are reacquainted. Will they get a second at love? A sweet and heartwarming read! she is the banker's daughter and he's the bad boy from the wrong side of town. They are lovers in high school until her dad breaks them apart unbeknownst to her. Now he's back in town and just bought the company she works for. Is there a second chance in their future? A ghost seems to think so. Highly recommend. Another winner in the Whiskey River Christmas Romance series. Packed with not only romance and a second chance love, but there are a few surprises along the way in of father and daughter's mending of their relationship and a romantic ghost named Felicity. The series, and especially this author's story will surely leave you with warmth in your heart. This is a sweet holiday romance - reunited lovers, a mischievous ghost, good friends, and small town heart. While this is the first Eve Gaddy book I have read, and the first in the series I have read, I don't feel like I have missed much by not reading the others. This book can easily stand alone. A very likable Christmas time, second chance romance. Savannah and Harlan were both strong characters, who, with a little help from a ghost, get their romance reignited 14 years later. The pace of the book was good, and you knew it was Christmas. Overall, and enjoyable book. *I received an ARC from Net Galley and this is my voluntary and honest review. A sweet Christmastime second chance romance. Harlan knows what he wants, and what he wants is Savannah. This is my first Eve Gaddy book. I really like her writing style. References to previous couples in the series have peeked my interest in reading more. Oh how I enjoyed Savannah and Harlan’s second chance love story, with Eve being the author and Felicity’s ghost whispering I was held enthralled. I recommend this read and I so want to say more but it would be a spoiler so I can’t. 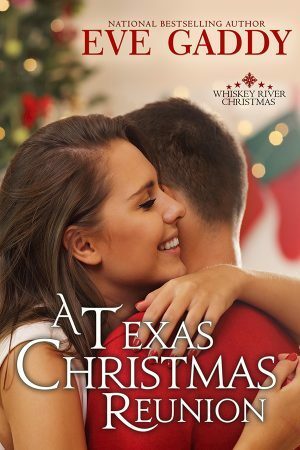 A Texas Christmas Reunion is a sweet, romantic Christmas story. I like the setting of the small town and the characters are well developed and interesting. I look forward to reading more in the series of Whiskey River. Eve is a member of Romance Writers of America’s Honor Roll for Bestselling authors. Her books have won and been nominated for awards from Romantic Times, Golden Quill, Bookseller’s Best, Holt Medallion, Texas Gold, Daphne Du Maurier and more. She was nominated for a Romantic Times Career Achievement Aw Eve Gaddy is the award winning, national bestselling author of twenty-seven novels and novellas.